As registered members, we received the deal in our mailbox this morning. Great minimalist design and an email I don’t mind receiving each morning. Straight to the point too and not cluttered with images threatening to use up my broadband bundle. Shows great on mobile devices too, minus the images. In short, we love the design. The email includes a link to a map of the merchant’s location. It will be interesting to see what the uptake is going to be. If people are going to forward each other these emails and numbers grow . More deals are the way they say from companies like Strachans Photo, Frampol (a tech company), Crumpler, Kariba Ferries and Canon. The one strange thing is that the deal is limited to email and SMS. The dhiri.co.zw website still just has the sign up form and nothing else. We expected to find the deal there as well. Anyway, as advised in the previous article, madhiri acho (the deals) are still limited to Harare. 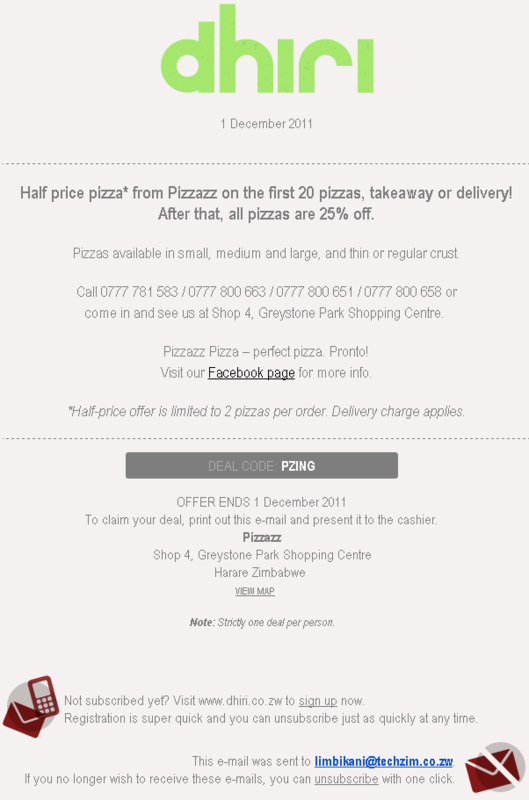 Well done on including the deal code in your screenshot, so that even unregistered buggers can get some free pizza. They may be able to get today’s, but they won’t be able to get tomorrow’s dhiri unless they’re registered. If people sign up today, they will still get today’s deal – provided it’s before 10pm when Pizzazz closes! This is great stuff from an e-commerce point of view. It’s now up to local businesses to sign up and get major publicity from such a campaign, and perhaps even benefit from the pull of impulse buying… we all love a bargain. In due time all participating businesses can expect to be overwhelmed by the huge influx of customers for their goods and services. Thumbs up Dhiri! “To claim your deal, print-out this email and present it to the cashier” – i thought businesses/services are meant to be going green? Lets minimize/eliminate unnecessary printing, maybe just mentioning the code perhaps should suffice? Otherwise awesome service and all the best! People are going to be frustrated that they are never in time to get the deal before the stocks run out – in the pizazz case the fact that people can get 25% for the rest of the day is good – my suspicion is that small places like pizazz may be swamped and the wait will not be worth the discount. Annoy people and they will go away or discount the value – only one deal a day could also be a schlepp – today I get US$2-00 off my pizza – tomorrow its something else in another area – they should group the deals – today get 15 deals in Sam Levy’s village in the following stores a, b, c, d etc. I am sure Dhiri is testing the market out, learning evolving and retrying – which is exactly the way I would do it. Good advice from Rob..Take not Dhiri.